SULLIVANS ISLAND, S.C. (AP) — Preservationists are using computer sensors and other high-tech methods to protect massive iron Civil War guns at a fort in South Carolina that fired on Fort Sumter to open the war in April 1861. 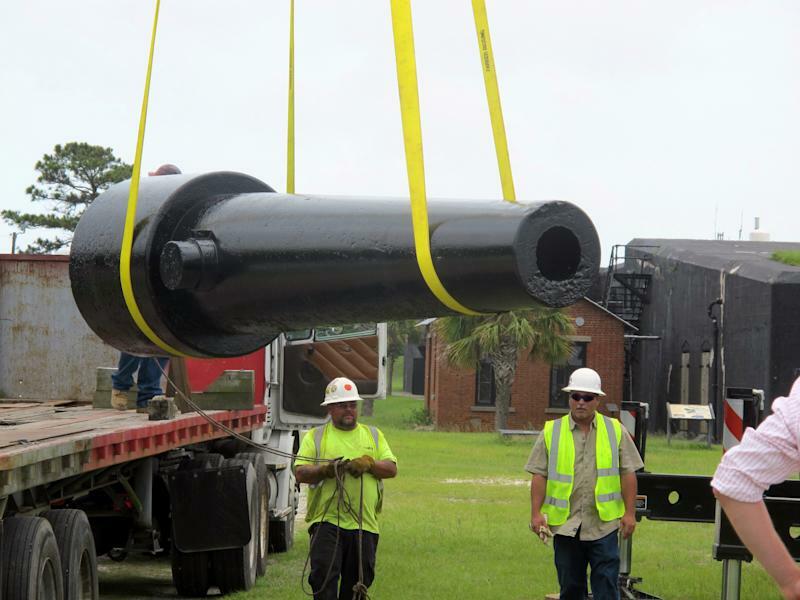 The sensors and modern rust-fighting epoxy coatings are being used to preserve historic siege and garrison guns, some of which were used to lob shells at Fort Sumter in Charleston Harbor when the war erupted. Union forces surrendered 34 hours after the bombardment started as the nation plunged into a bloody, four-year war. 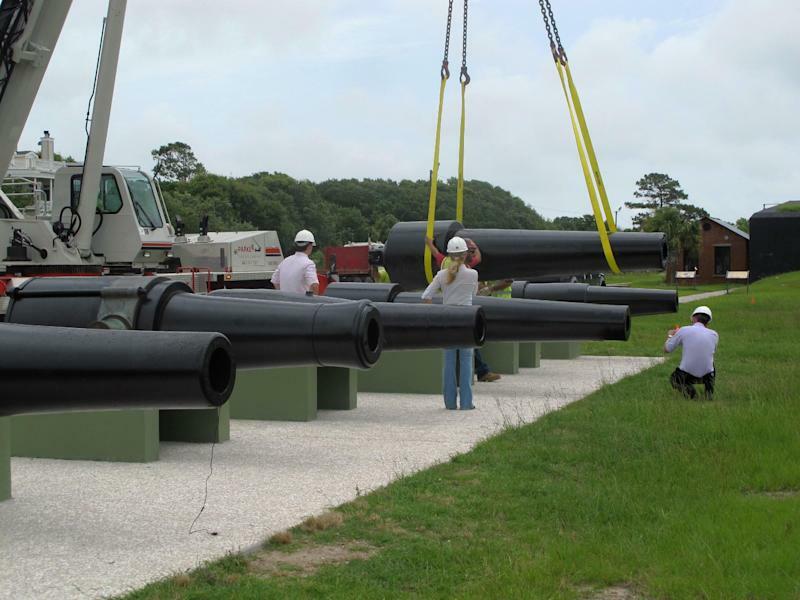 Ten massive guns from Fort Moultrie on Sullivans Island, which is part of the Fort Sumter National Monument, were recently conserved as part of an ongoing program to protect the historic pieces from the salty, humid air. The guns were cast in foundries both in the North and South a century and a half ago. 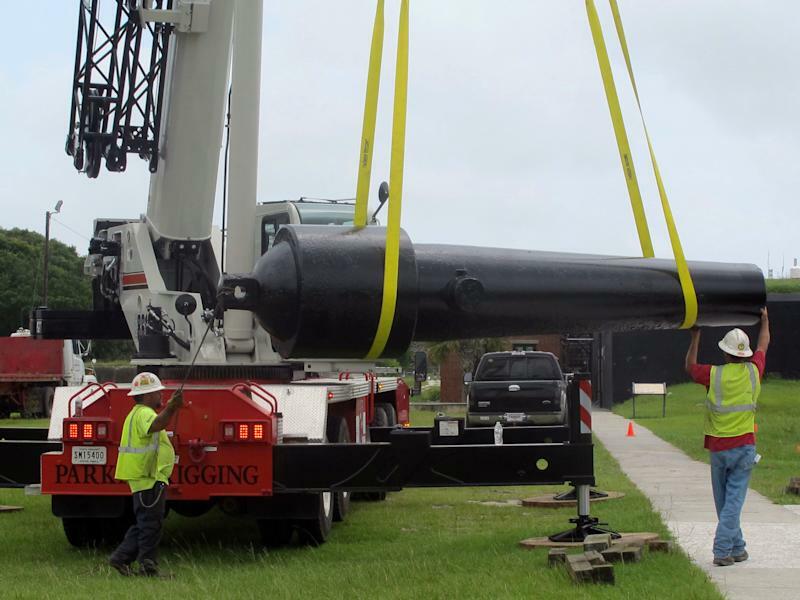 The last of the guns, a 7-ton Union rifled Parrott gun suspended in a yellow sling held by a crane, was slowly jockeyed into place onto a new concrete base last week. It completes what the fort refers to as Cannon Row, where seven of the heavy guns are lined up next to each other. The conservation work is being done under a multiyear, $900,000 agreement between the National Park Service and the Clemson University Restoration Institute, said Rick Dorrance, chief of resource management at the national monument. Last winter, institute conservators visited Sumter, where they conserved shells that had landed in the fort walls during the bombardment. The shells were being preserved in place because removing them would damage the fort's fragile brickwork. Institute conservator Liisa Nasanen was at Moultrie last week as the last of the heavy guns was returned from weeks of conservation. All but one are now coated with a modern epoxy. "The paint that was on them was an oil-based coating. That is historically correct, but it's not something that necessarily does the trick when it comes to keeping the artifact safe," Nasanen said. "We kind of borrowed ideas, and this epoxy system is something very widely used in the marine industry." The one cannon repainted with oil-based paint will allow comparisons as to which system works best. In addition, sensors have been sealed in the barrels of the cannon to store information on humidity and temperature. The data can be downloaded to a computer to provide continuous monitoring of the iron inside the cannon. The system is modeled after one used at Fort Jefferson in the Dry Tortugas National Park off of Key West, Fla. In a project started there five years ago, nine of the fort's 10 large garrison guns have been conserved. The sensor system was developed by conservator Ron Harvey of Tuckerbrooke Conservation of Lincolnville, Maine. The interior of the barrel is closed and sensors placed in it with 25 pounds silica gel to reduce moisture in the unforgiving marine environment. Fort Jefferson is basically built on a coral reef. "We still have not hit above 10 percent humidity," Harvey said. "If we are looking at reconditioning these guns by switching out the silica gel every five to 10 years, that's not a bad maintenance cycle." At Moultrie, even at 150 years old, most of the guns were in good shape when initially checked by conservators, Nasanen said. "There were variations though. They come from different foundries and have different compositions," she said. "Some of them that had been on the ground were in worse condition because there would be most exposed to the elements." Moultrie's collection includes some rare Confederate pieces, said Rick Hatcher, historian for the national monument. "It's extremely rare to have Civil War combat cannon of this size — siege and garrison guns — in one place where visitors can go see them," he said. "If you go to Gettysburg or Chickamauga you will see dozens and dozens of field artillery pieces, but it's very rare to see this many siege and garrison guns." That's because most such guns did not survive after the war, he added. "With Confederate-made guns, some were kept as trophies of war but others were considered not in that good of condition or maybe not that well-made and they were sold for scrap," he said, adding even Union pieces were sold. "We had a $3 billion war debt after the Civil War and they were looking for ways of paying it off." You wouldn't need the sensor system for smaller pieces like cannon one sees on a battlefield, because the insides of those barrels can easily be reached for maintenance, Harvey said. With the 150th anniversary of the conflict, there's renewed interest in preserving Civil War items, "certainly within the Park Service, but you also see this also in museums and in historical societies within smaller towns," he said. Big guns, he said, may not seem exciting to some. "But you look at the pieces and for some reason, regardless of what the care or lack of care was, they survived," he said. "As an artist you sign your work, as a conservator you don't. I love the idea that many, many decades after I'm gone those pieces are still going to be around."